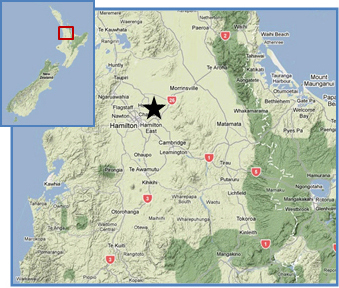 The Scott Farm flux station is located on a Dairy NZ research farm 7km northeast of Hamilton the Waikato region on the North Island of New Zealand. It was established in December 2007 and is managed by the Department of Earth and Ocean Sciences at the University of Waikato . Since 2010, the Scott Farm flux station is supported by the New Zealand Agricultural Greenhouse Gas Research Centre (NZAGRC) .